Thunder is rumbling outside as I’m writing this. We’ve had a lot of much needed rain here lately. Soup weather seems here to stay for a while. 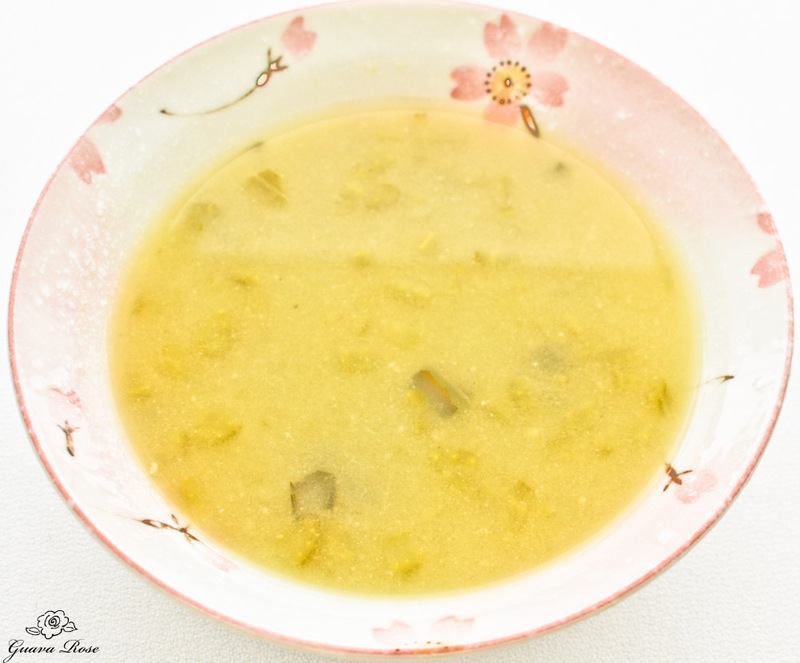 I came up with an easy soup that requires very few ingredients: a small piece on kombu, 1 cup of split peas, a couple of stalks of celery, and some white miso and vinegar. Garnish with a few toasted pumpkin seeds if you like. A little scoop of pressure cooked brown rice sprinkled with gomashio (ground sesame seeds + sea salt) rounds out the meal. Soak kombu in the ½ c. water 10-20 minutes until softened. Save the water and dice the softened konbu into ¼" pieces. In a soup pot, rinse and drain the split peas. Add the diced konbu and soaking water, diced celery, and the 2-1/2 cups of water. Leave uncovered and bring to a boil. Skim off the foam that rises to the top. Turn heat down to medium low and simmer for 40 minutes, leaving the lid cracked open. Stir occasionally, mashing down the peas as they soften. Cook until the peas have mostly turned to mush. Add sea salt and remaining 5 cups of water. Cover, turn heat up and bring the soup to a low boil. Turn off heat and remove pot from the stove. 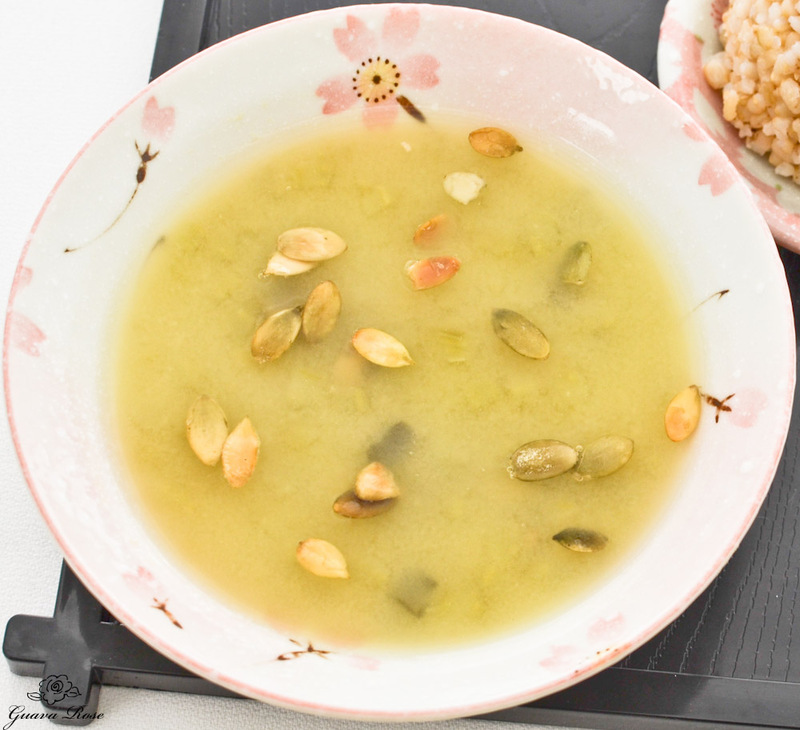 Place miso in a large soup bowl. 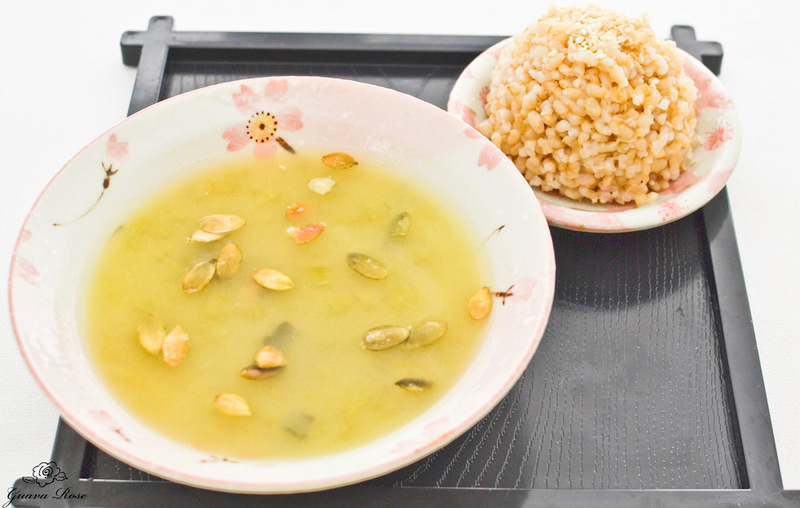 Ladle in 1 cup of the hot soup and blend the miso in well. Pour this back into the soup pot and mix into the soup. Stir in vinegar. Serve topped with pumpkin seeds if desired.